Case Study - Beer or Cancer? Solutions: Case Study - Beer or Cancer? All the following questions are from previous exams for Economics 103. They are duplicates of the questions found in the Topic sub-sections. 1. Which of the following statements about opportunity cost is TRUE? I. Opportunity cost is equal to implicit costs plus explicit costs. II. Opportunity cost only measures direct monetary costs. III. Opportunity cost accounts for alternative uses of resources such as time and money. a) I, II and III. d) I and III only. 2. Which of the following statements about opportunity costs is TRUE? I. The opportunity cost of a given action is equal to the value foregone of all feasible alternative actions. II. Opportunity costs only measure direct out of pocket expenditures. III. To calculate accurately the opportunity cost of an action we need to first identify the next best alternative to that action. b) I and III only. d) None of the statements is true. 7. Suppose you have bought and paid for a ticket to see Lady Gaga in concert. You were willing to pay up to $200 for this ticket, but it only cost you $110. On the day of the concert, a friend offers you a free ticket to the opera instead. Assuming that it is impossible to resell the Lady Gaga ticket, what is the minimum value you would have to place on a night at the opera, in order for you to choose the opera over Lady Gaga? 9. I am considering loaning my brother $10,000 for one year. He has agreed to pay 10% interest on the loan. If I don’t loan my brother the $10,000, it will stay in my bank account for the year, where it will earn 2% interest. What is the opportunity cost to me of the loan to my brother? 10. In January, in an attempt to commit to getting fit, I signed a year-long, binding contract at a local gym, agreeing to pay $40 per month in membership fees. I also spent $300 on extremely stylish gym clothes. This morning, I was trying to decide whether or not to actually go to the gym. Which of the following was relevant to this decision? a) The $40 that I paid the gym this month. b) The $300 I spent on gym clothes. c) The fact that I also had to write a 103 midterm exam today. d) All of the above were relevant. 11. Suppose you have bought and paid for a ticket to see Kanye in concert. You were willing to pay up to $350 for this ticket, but it only cost you $100. On the day of the concert, a friend offers you a free ticket to Lady Gaga instead. You can resell your Kanye ticket for $80. What do your sunk costs equal? 12. Which of the following statements about sunk costs is FALSE? I. Sunk costs are those that cannot be recovered, no matter what future action is taken. II. Because sunk costs cannot be recovered, they are irrelevant for future decision-making. III. The presence of sunk costs can affect future decision-making, if they are large enough. a) II and III only. 13. As a member of UVic’s University Club, I pay $30 per month in membership fees. In a typical month I spend about $50 on beer at the Club. Every month I also have the option of attending a meeting of the whiskey club (open only to Club members), at a cost per meeting of $15, payable at the beginning of each meeting. Given this, what do my monthly SUNK COSTS equal? a) Taking actions whenever the marginal benefit is positive. b) Taking actions only if the marginal cost is zero. c) Taking actions whenever the marginal benefit exceeds the marginal cost. 2. 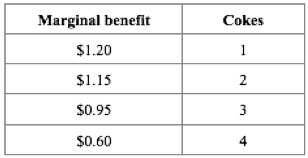 Jane’s marginal benefit per day from drinking coke is given in the table below. This shows that she values the first coke she drinks at $1.20, the second at $1.15, and so on. Previous: Solutions: Case Study – Beer or Cancer? Topic 1 Multiple Choice Questions by University of Victoria is licensed under a Creative Commons Attribution 4.0 International License, except where otherwise noted.